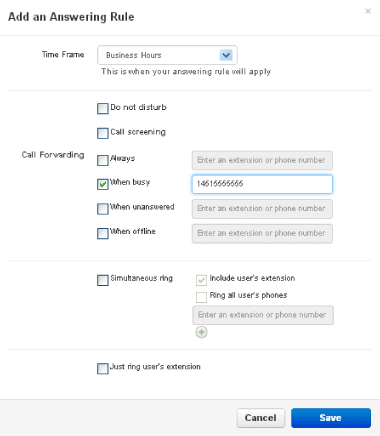 You can choose to forward calls to another phone number or extension based on a set of rules. For example, when my phone is busy I want it to ring a different number. Select Answering Rules from the top menu. Select Add Rule at the top right. Select a Time Frame from the Time Frame drop down box. If you have not created a suitable time frame you can do so from the Time Frames menu. 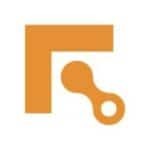 Select the type of forwarding that best suits your needs. A description of the different types of forwarding can be found on the Forwarding Features page. In this example when my phone number is busy during business hours it will instead ring to 1(415)555-5555. Click Save. Note that in cases of conflicting rules the rule on the top of the list takes priority. In the above example the “do not disturb during business hours” rule never takes effect because the default “always ring my extension” rule is ranked above it. You can fix this by dragging the ”do not disturb” rule above the default rule.